Do I really need to explain why I read this book? If you’re a parent, then you have already spent a minute wondering how your children got so spoiled. Because there is “nothing new under the sun,” the subject of spoiled children and their lack of gratitude has existed since the beginning of time, but what makes this topic unique to the 21st Century is our lightning-fast progress in the world of technology. The Internet has eaten our brains, and we must do what we can to save our children from the same fate. My point is this: While Chuck and I have resisted giving our boys their own hand-held devices, they do not tire of asking to use ours. While we have a family rule of “You’ll eat what your Mama cooked you,” they do not tire of complaining about the tiny speck of green vegetable on their plate. And while we have a hard and fast rule of allowing one sport for one kid in one season, they do not tire of complaining about missing out on sports year-round, fancy camps and fancy gear. For the most part, I found the book helpful and affirming, particularly in all the ways we’ve continued to tell our boys NO. (No, you can’t have a cell phone. No, I’m not buying you an iPad. No, you don’t need cable in your bedroom.) It also helped me map out how to approach those things when time and maturity reach the right point. Though the Welch family is a little more conservative than our own, I still found the theology behind trust, prayer, and patience to be wise. Just as God gives us boundaries, we must also give them to our children. Additionally, we must hold fast to the promise that God isn’t done with us yet and we must be open to all the ways He can teach US to be better parents. Whether you’re already knee-deep in parenting or just starting that roller coaster ride, I recommend this book. It’s a quick and easy read. 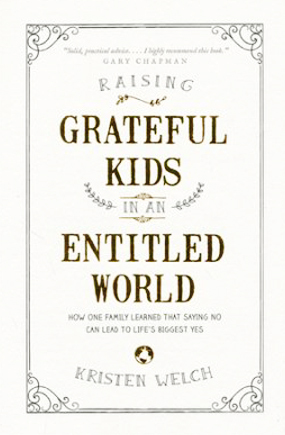 Buy Raising Grateful Kids in an Entitled World here.